Update 8/13/18: Twin Peaks certainly wouldn't be complete without its new third season, The Return! So we'll look at the DVD and blu-ray editions of that. 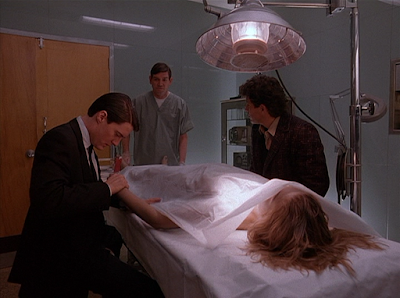 And we've got Criterion's new blu-ray edition of Fire Walk With Me as well. Twin Peaks began as the ultimate television experience, combining the talents of the man behind Hill Streets Blue with the mad genius behind Blue Velvet. It was a dark, layered and strange mystery mini-series about the secret double-lives we all lead getting uncovered when an the FBI is brought in to solve the murder of the home-coming queen in an idyllic small town. Just about everything you can imagine is dug out of peoples' closets from affairs and prostitution to drugs and abuse to an alternate dream reality and afterlife that really no one could have imagined. It blew away everyone's expectations in both ratings and critical reviews, and the dubious decision was made to delay the resolution of the mystery and ride wave of success just a little bit longer. 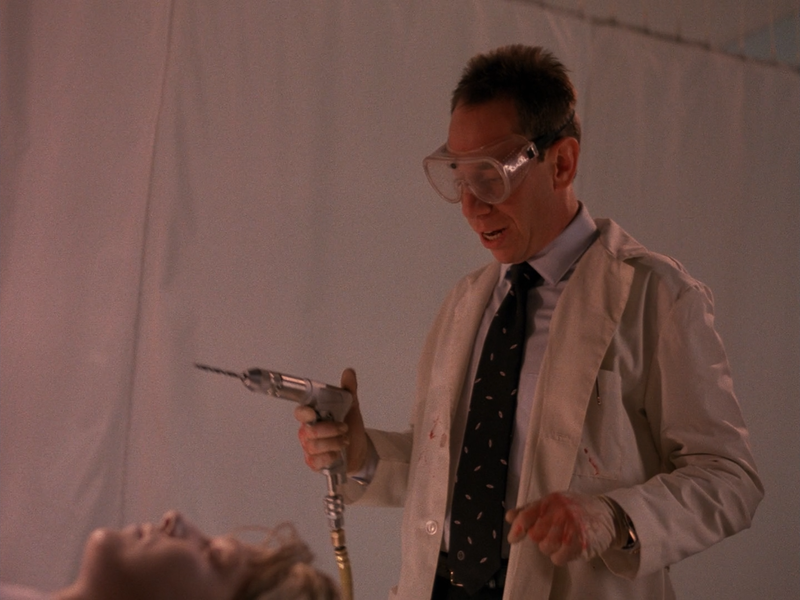 Due to fan pressure, they finally had to solve the mystery, but the series went on for a second season anyway, with Lynch and Frost focusing on other projects and leaving the series in the hands of others, and the quality dropped like a stone. It wasn't a total loss, you still had a fantastic cast playing the characters you loved, but everybody was treading water at best as bad decisions and plot points continued to pull the series apart until it was quickly cancelled. Lynch returned to direct the final episode, which showed a clear bump up in quality, but it was too little and much too late. 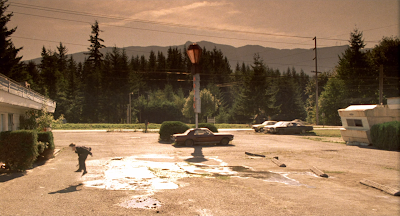 Even at the show's lowest point, however, it was determined that if everyone who watched the series would pay to see a movie, it would be a predetermined success, so Lynch returned to the town of Twin Peaks once more for the feature-film Fire Walk With Me, which was a little patchy at points, but mostly a very engrossing and vindicating prequel. 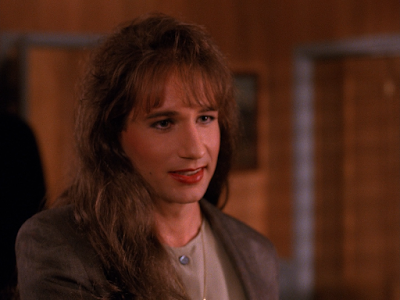 Now, Twin Peaks history on home video is a little convoluted, so bear with me. 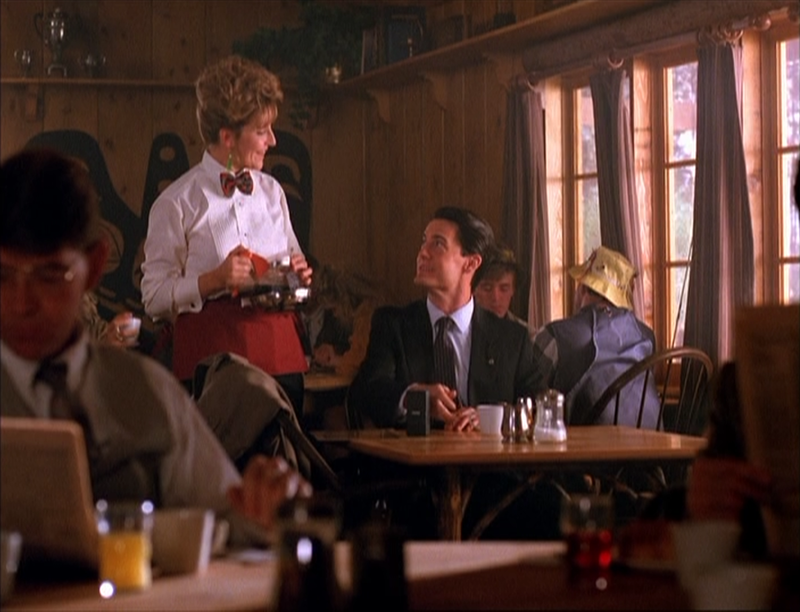 At the very beginning, before people know what a cultural phenomenon Twin Peaks was to become, the studios decided to release just the Twin Peaks pilot, with the ending of the first season tacked on as an awkward resolution, as a stand-alone movie overseas. What this did is leave the pilot in the hands of Warner Bros, and the rest of the series with Paramount. So when season 1 was first released on VHS, and again on DVD, in nice boxed sets, it was missing the first episode... which, you know, is hugely essential to the series. So Warner Bros wound up releasing it separately on VHS, and there was a common import PAL DVD from Republic Pictures everybody copped in 2001, which thankfully excluded the false "European ending." Other regions didn't have this problem, though, so you could get season 1 including the pilot episode as a full set if you imported from almost any other country. You'll see the German DVD set in this comparison. So, okay, anyway, Artisan put out special edition boxed sets of season 1 (sans pilot) in 2002. That same year, New Line released Fire Walk With Me as a semi-special edition DVD. Paramount initially released season 2 by itself in 2007 (as season 1 was already out). But then later that year, the entire series was remastered, and CBS re-acquired the rights to the pilot episode, putting them all together in their Definitive Gold Box Set. How "definitive?" Well, it had the pilot reunited with the series (which you can watch with or without the international ending), both seasons, and some all new extras, but it was lacking some features from the Artisan sets and still, didn't have Fire Walk With Me. 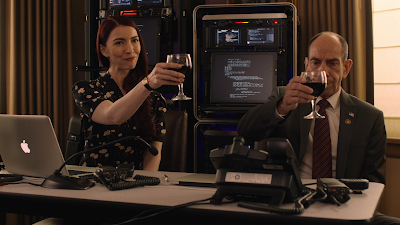 Then, in 2014, we got The Complete Mystery set, which included both seasons, the pilot, and Fire Walk With Me, all in HD on blu-ray for the first time, and with all new extras, including the 90 minutes of highly sought-after deleted scenes from Fire. But it still doesn't have everything from the Artisan sets, and it even lost a few things from the Gold Box. Yeah, it's all pretty confusing. But don't worry, we're going to nail it all down. But first let's look at the restorations. 2002 German Paramount DVD top; 2007 Gold Box DVD mid; 2014 Paramount blu bottom. 2002 German Paramount DVD left; 2007 Gold Box DVD mid; 2014 Paramount blu-ray right. So yes, looking back, the restoration between the two DVDs is quite clear. The older discs really look pale and fuzzy compared to the Gold Box. 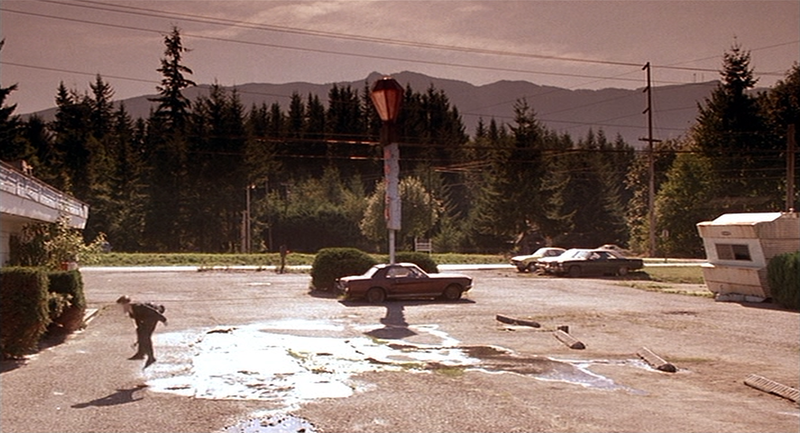 The blu-rays, naturally, are clearer still. They're all framed at the normal 1.33:1 television ratio, although the Gold Box and blu-rays have slightly more information along the edges, with the old discs zoomed in just a sliver. So I'm happy to report at no time were we being sold a bill of goods; there is an appreciable uptick in quality with each re-release. Look at the waitress close-ups full size and you'll really see the benefit of the HD. For the record, I used to own the original Artisan boxed set and the Republic DVD. I no longer have them for the comparison, but the as I recall the Artisan set was a direct match of German set seen here, and the pilot DVD was about the same (FTR, the fingernail examination shots above are taken from the pilot episode), if not even a little worse. The fundamental fact is that, image quality-wise, there's really nothing to go back for. Audio-wise, the original sets and Gold Box all gave you DTS 5.1 mixes of the episodes, Dolby 2.0 on the pilot (excluding the Artisan set, of course, which doesn't have the pilot), a couple mono dubs, and multiple subtitle options. The blu-box gives you DTS-HD 7.1 and 2.0 mixes, plus foreign dubs and multiple sub options. But we can't leave the audio discussion behind without talking about perhaps the most controversial aspect of the Entire Mystery set... audio sync issues. At a few points, in episodes 3, 9 and the on some of the Fire Walk With Me deleted scenes, the sound goes out of sync. Maybe. On some players. Some players will sync up if you adjust a frame-rate setting on them, and testing them just now on my PC, they seem perfectly in sync (and I'm looking at the specific scenes very closely). So people have been asking for a recall for years, Amazon has pulled the set from their store multiple times, but it doesn't seem like anything has been done. I guess it's sort of a player-specific issue, but a very common one, in that it will only work with certain brands or firmware... or maybe a quiet replacement was done, and newer editions are corrected, but I've seen no evidence of this besides wishful thinking. The accounts I've read say the sync isn't too far out of whack, so casual viewers might not even notice if they're not paying attention. But yeah, it's unfortunate, and something CBS really should have definitively resolved, especially considering the prices they charged for the set. But there it is. Fingers cross, and it will play correctly for you, too! New Line 2002 DVD top; Paramount 2014 blu mid; Criterion 2017 blu bottom. Can't forget about Fire Walk With Me! 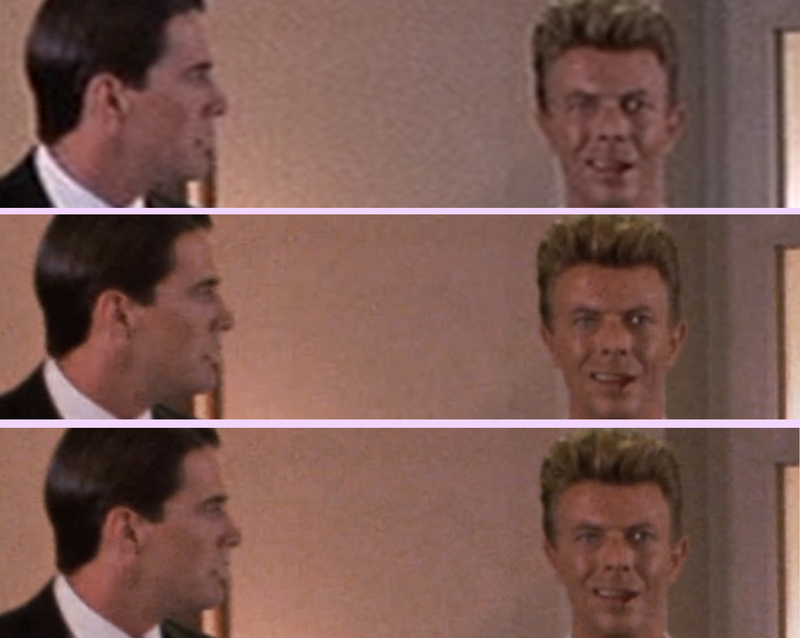 Now, even the old DVD was anamorphic widescreen, but the second thing you'll probably notice on this comparison is that both are nicely matted to 1.85, but the new blus have a decent amount of additional picture on all four sides. You shouldn't need me to even say what the first thing is: they've really done some changes with the color timing. Some scenes are more subtle than others (i.e. the first set compared to the second set), but it's throughout the whole film. I'll assume the blus are more accurate and what Lynch wanted, but I couldn't say for sure without cornering him in a room. What I can say, though, is the the image is much clearer. Grain honestly looks a little bit patchy, but it's a sure step forward without all the smudgy compression issues or edge enhancement the old DVD has. And between the two blus? Well, they're clearly using the same master, but Criterion's encode seems a bit more even. In motion, it's unlikely anybody would be able to spot the difference, but in close-up comparisons, I'd give Criterion's new disc the edge. But again, practically speaking, they're essentially identical. Again, the old DVD gave us a 5.1 mix, 2.0, English subs, plus a French dub and some foreign subtitle options. And the blus give us another DTS-HD 7.1 mix, plus 2.0 and English subs. The difference between the two blus is just that CBS's disc also throws in many additional foreign dub (French, German, Italian, Japanese, Castilian and Latin) and sub (Danish, Dutch, Finnish, French, German, Italian, Japanese, Norwegian, Portuguese, Castilian, Latin and Swedish) options. 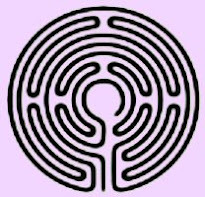 Now let's get into the really complicated stuff. The special features. It doesn't help that plenty of the extras are presented almost like easter eggs, where you have to click on unmarked symbols to discover what will play, but let's do this. First of all, the old Republic pilot DVD was barebones (except for some bonus trailers), and the German set doesn't give us any more or less than the English Artisan set in terms of extras. They're identical. So what did the original season 1 sets give us? Firstly, the "Log Lady" intros to each episode (except the pilot), which feature the same actress from the series giving enigmatic intros to each episode and that were recorded for the Bravo channel when they reran the series back in the late 90s. 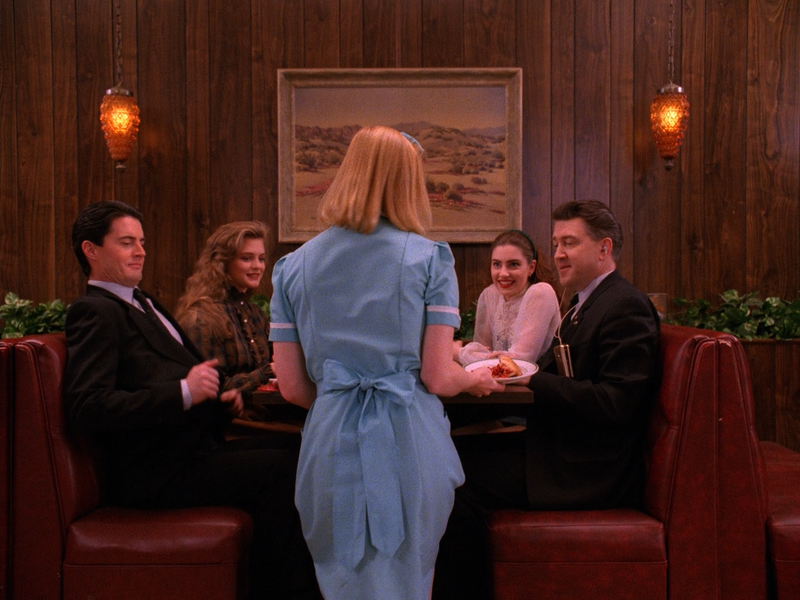 Secondly, and more importantly, every episode (again, except the pilot... basically, there are no extras for the pilot ever) has audio commentary by various crew members (directors when it wasn't Lynch, writers, DOPs and a production designer). There are also on-screen trivia track notes and hidden interview clips with the people doing the commentaries for each episode. Then the set rounds out with a collection of interviews including: an interview with Mark Frost, a featurette on the Red Room's backwards talk, a 22 minute featurette on Lynch, a featurette on the Twin Peaks diner and on-camera "Postcards From the Cast" interviews with most of the cast. All told, the postcards are a full hour's worth of interviews, and they're quite interesting, so it's worth clicking through them all. There are a couple other easter eggs, but they're just DVD credits and special thanks stuff. 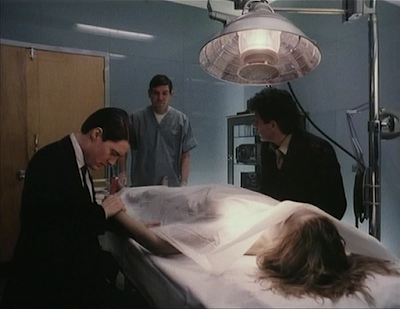 The old sets also include a booklet with notes and a text interview with Sheryl Lee (but if you import, remember your booklet may not be in English). Paramount's initial season 2 set is a lot like Artisan's season 1 set, minus commentaries: Log Lady intros, a short interview on each disc, and about 40-minutes worth of additional interviews at the end. Now we come to the Gold Box. Interestingly, it loses almost all of the episode-specific stuff. It has the Log Lady Intros, but none of the audio commentaries, trivia tracks, or easter egg interviews from the Artisan discs. 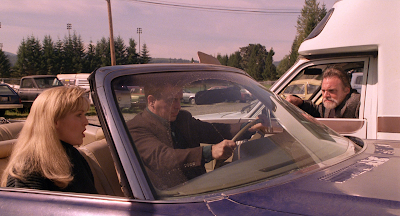 I've read it suggested online that Lynch didn't approve of commentaries and such, and requested they not be included, but I suspect it's more an issue of licensing from Artisan, as it also doesn't include the Postcards and other interviews and featurettes from their set. Then again, it doesn't have the interviews from Paramount's early season 2 set either, which really seems strange to me. But it does have a large collection of its own special features. Disc 9 has a few deleted scenes and a stills gallery on it. And then all the rest is on disc 10, including a feature-length making of documentary called Secrets From Another Place and a half-hour featurette called "A Slice of Lynch." Then there are two Twin Peaks sketches from Saturday Night Live with Kyle MacLachlan, a collection of featurettes about a Twin Peaks festival (some very short, but about a half hour total). 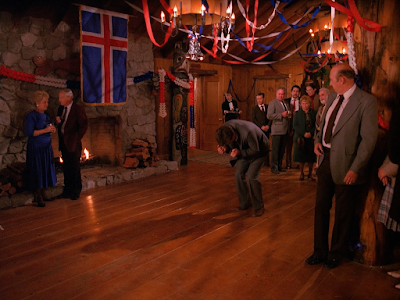 There's a music video for the theme song '"Falling," several galleries, and a huge collection of Twin Peaks commercials. 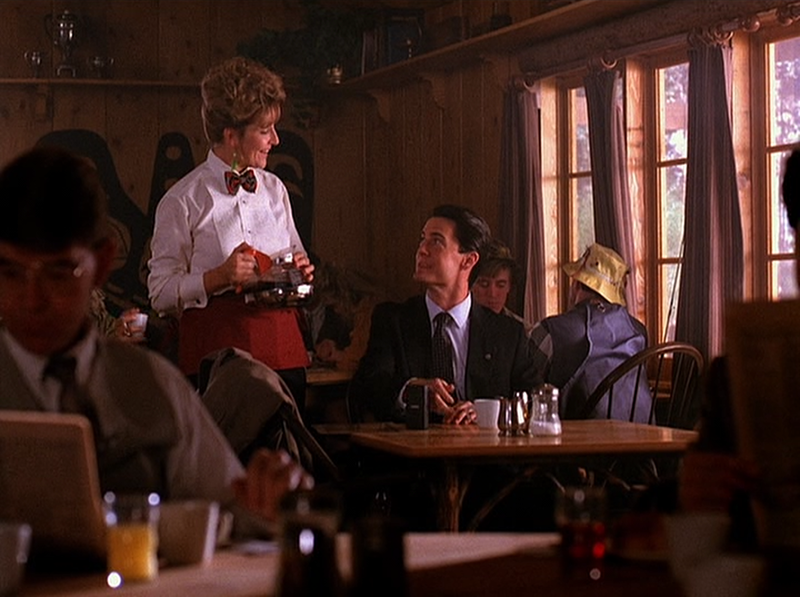 There are ads for the show when it was airing, but also amusing ads for other products that used Twin Peaks' IP including a series hosted by the character Lucy, and a long collection of spots for their 1-900 hotline. They also have the alternate ending for the pilot viewable separately, some unrelated bonus trailers, and it comes with an insert for David Lynch's coffee brand he was (is?) selling. Finally, we come to The Entire Mystery. They also have both versions of the pilot and the Log Lady intros, plus they have the recaps and previews for each episode as options, which is a nice touch. A few of the episode discs have promos and galleries on them, but most of the special features is saved for the later discs. Secrets From Another Place is here, the 900 number stuff, the festival material and other promos, etc. 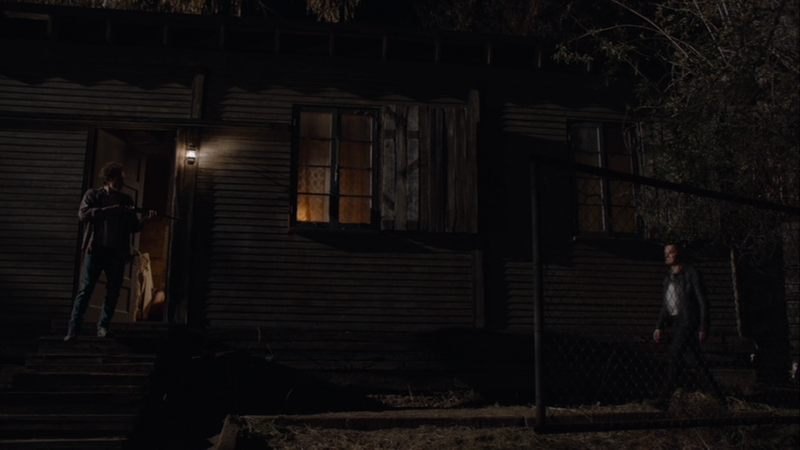 One interesting change off the bat is the "A Slice Of Lynch" featurette from the Gold Box is here, but re-edited and about twenty minutes longer! 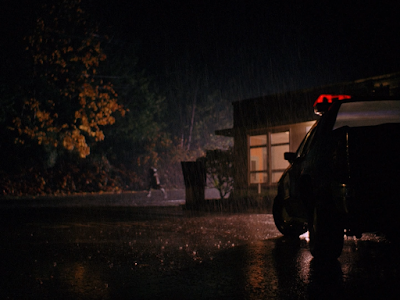 They call it "A Slice of Lynch: Uncut. "The deleted scenes are carried over, but there's also more of them, which is great. And there's a new collection of outtakes. There's a new featurette on the filming locations and thankfully, all the interviews from the Paramount season 2 set are here. Even better, a lot of the Artisan stuff has now been carried over, including the diner featurette, the Mark Frost interview, and the hour's worth of "Postcard" interviews. BUT... the Entire Mystery doesn't recover the entire Artisan ball that the Gold Box fumbled. It doesn't have any of the audio commentaries. Maybe the bit about Lynch objecting to them was right after all. It's also missing the corresponding interview snippets with the commentary participants. And some of the fun stuff from the Gold Box is missing, like the Saturday Night Live clips, the music video, and a bunch of the funny commercials. Very frustrating. CBS's Fire Walk With Me is completely frustration free, however. 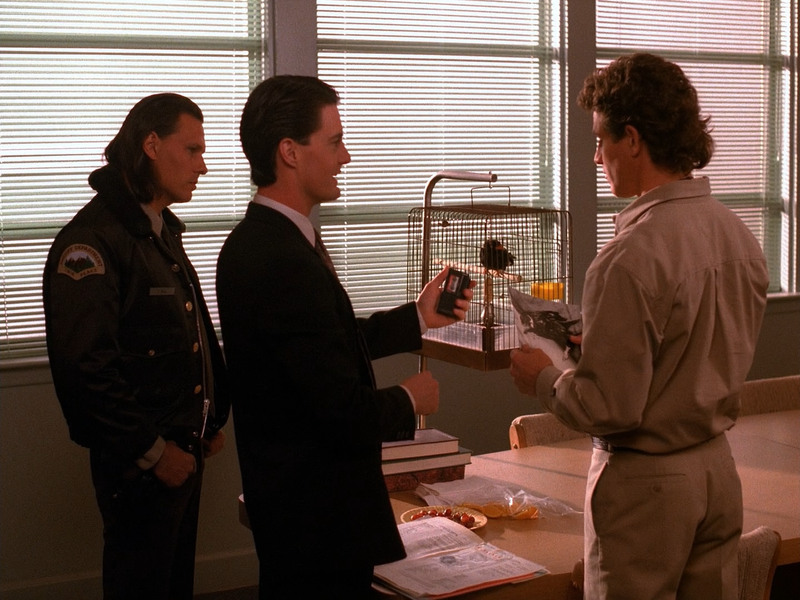 The original DVD had a nice half-hour featurette called "Reflections On the Phenomenon Of Twin Peaks" and the original trailer. Both of those have been carried over to the blu. Also included, as I've already mentioned, are over 90 minutes of deleted scenes. What's interesting is we see here that a lot more of the original television actors had minor parts and cameos that ultimately got dropped from the film. I think the final film is better for it, but fans will definitely get a big kick out of seeing these scenes. 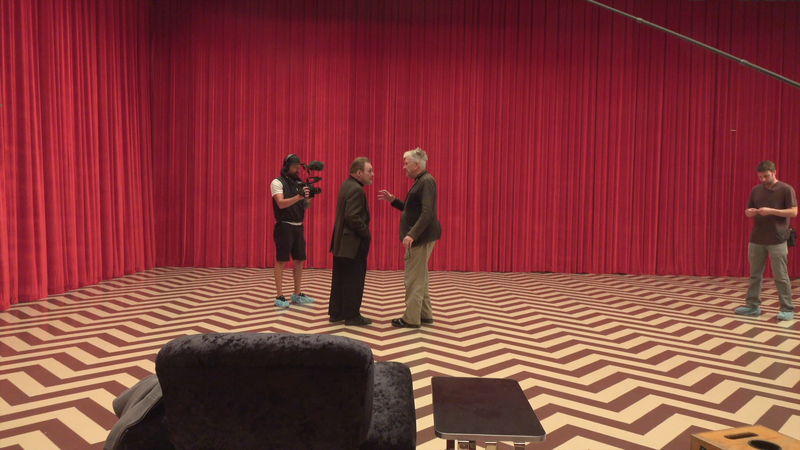 Then there's a weird, almost 40-minute featurette called Between Two Worlds where Lynch talks to a bunch of the actors in character (a bit of a weird "where are you now" feature, with Mrs. Palmer especially perhaps giving us a little insight into what to expect in seasons 3 and 4), and they discuss aspects of their fictitious lives. There are two more half-hour featurettes where the cast and crew talk about the how the show got cancelled and became a movie, a brief collection of vintage EPK interviews, a couple extra trailers, a stills gallery and a collection of "atmospherics," which are like little video loops from the film. As for Criterion's pass at the film, they include some of the extras, including the entire run of deleted scenes, a shorter version of Between Two Worlds, and the trailers. All the vintage featurettes and interviews got dropped. But in their stead, Criterion created two new, nice and in depth on-camera interviews with Cheryl Lee and composer Angelo Badalamenti. One can't fault The Entire Mystery for not including these, since Criterion's stuff came out afterwards. But essentially, fans who already have the box have to ask themselves if they need those two interviews enough to spring for the Criterion. And speaking of stuff you can't fault The Entire Mystery for not including since it was released afterwards, there's a whole new season of Twin Peaks now! It aired on Showtime between May and September of 2017, and came out on DVD and blu-ray just before Christmas. Entirely directed by David Lynch this time, and co-written between him and Frost, I'm happy to report that this season doesn't go off the rails like season 2 did. Nearly the entire cast and crew return for this outing, with a whole bunch of new, impressive actors added to the roster (like, oh say, Laura Dern, Naomi Watts, Matthew Lillard, Jane Adams, Jennifer Jason Leigh, Tim Roth and Jim Belushi to name just a few), the series rejoins our characters 25 years later, still dealing with Cooper's dark doppelganger, who split from him and escaped the ledge at the very end of season 2. 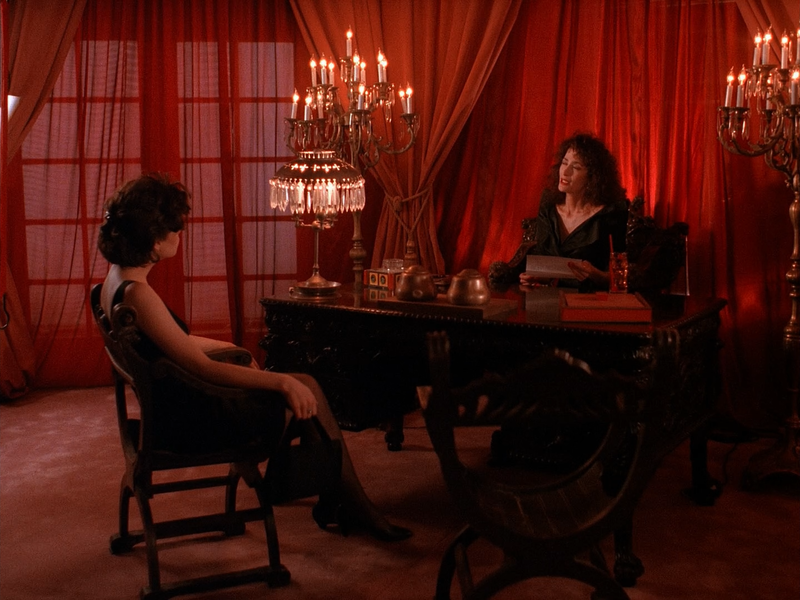 Eschewing the conventions of the Dynasty-style television of the original seasons' era that it was in some ways sending up, or at least subverting, season 3 flies even further out into space and the idiosyncrasies of Lynch's artistry. There were a few moments where I feel the tone slipped from their grasp momentarily (the green gardening glove was a bit too silly for my tastes), and it doesn't have the driving focus of solving Laura Palmer's murder like season 1 did. But overall, it's as engrossing as Twin Peaks has ever been, and in a way, it's even more exciting for being one of the few cinematic journeys with a properly arcing narrative where you still cannot predict where it'll go next. I know some viewers have criticized it for being too esoteric, or even nonsensical, but to them I'd say, give it a second watch, think about it, and I don't think it's any more indecipherable than, say, Mulholland Drive. 2017 CBS DVD top; 2017 CBS blu bottom. The series is in 16x9 now, 1.78:1, and looks pretty great, settling in alongside its new "golden age of television" peers. Unlike its predecessors, this season was shot digitally, so there's no point in trying to peck out film grain or anything. I think it's safe to assume this is a more or less direct port of the DCP, with the blu-ray having a much crisper, more satisfying image than the noticeably softer DVD. It was shot in 4k with an HDR-friendly camera, though, so it's a bit of a shame there wasn't any UHD. But it's hard not to be happy with the blu-ray, which looks even a bit better than it originally aired. The series is presented in Dolby 5.1, and TrueHD on the blu, with optional English subtitles. And one neat thing about the DVDs and blu-rays is that, well, you remember when the series first aired, they showed the first couple of episodes together in two hour chunks, right? And those eps were actually edited together into one seamless double-episode, with one only series of credits each and all. Well, these boxes give you those episodes both ways. So you can watch each episode as an individual hour with full credits, or the pairs edited together as they first aired. Not a big deal, but just like the previous seasons giving you the options to watch the episodes with the bumpers and all, it's nice that they gave us all the options here as well. Fans should be delighted with its over 6 hours of special features. Most of it consists of a series of behind-the-scenes documentaries called Impressions, which give you a wonderfully candid look at the making of the series as Lynch and company travel all around the country filming its various scenes. Seriously, this is one of the best 'making of's I've ever seen on any disc. It does have some cornball narration which I could've just as well done without; but the substance of the content is so great, at the end of the day, who cares? Then there's an hour-long comic-con panel, hosted by the creator of Lost, with some of the series biggest stars. It's alright, but nowhere near as interesting as those docs. It's also nice that they kept the small series brief promo featurettes that were previously available when the series was airing On Demand. And there's a stills gallery and a reel of company logos, for the one weirdo who cares about that. So, all of the above are included in both the DVD and blu-ray sets. But the blu-ray has almost another hour and a half of exclusive special features that were left off the DVDs. There are two more half-hour docs by Richard Beymer (yes, the actor who plays Ben Horne), which are essentially just like the other 'making of's, but without that narration. In other words, they're great. Then there's another more traditional, but still quite good half hour featurette by the guy who directed some of the features for The Entire Mystery. So ultimately, of course The Entire Mystery Collection is the way to go. It looks the best in HD... there's that unfortunate sync issue, but even if you get it on your player, it's probably better to live with that than the standard definition episodes. Plus, it has the largest collection of extras. Just not all of the extras. In fact, it's missing enough from the old set that I'd actually recommend picking up the Artisan season 1 set (or a foreign version with the same extras, like I did) for the commentaries. You can find them used pretty cheap nowadays, and they're substantial enough extras to make it worthwhile. 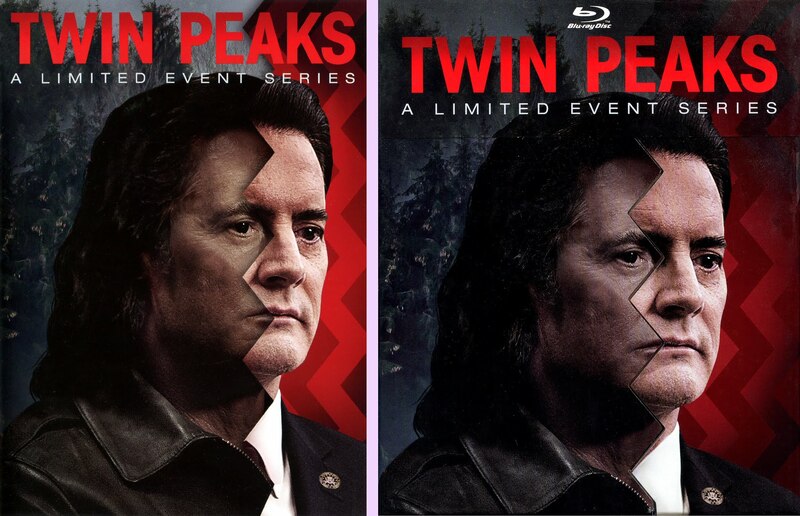 It's frustrating that they dropped some Gold Box stuff, too; but I wouldn't recommend getting that unless you're super rich or a Twin Peaks mega-fan, in which case I'm sure you've already collected every Twin Peaks VHS, laserdisc, DVD and blu-ray there is to have anyway just for the different covers. And then you might as well spring for the Criterion Fire Walk With Me, too. So, to be clear, all other previous editions, like the Paramount season 2 set, the New Line Fire Walk With Me DVD, and any screwy old pilot-only discs you have are totally obsolete. Unless you're just collecting them as objects, you can go ahead and chuck those. The Gold Box and Criterion Fire Walk With Me disc have some exclusive extras, but not a lot. What I seriously recommend is The Entire Mystery 10-disc version, the season 3 blu-ray set, and Artisan's season 1. But buyers beware! 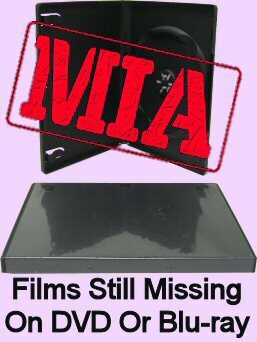 The Entire Mystery set, which was originally comprised on 10 blu-ray discs in a stylish box, has been quietly replaced in the US market with a lower budget 9-disc set in a more standard plastic case. As of September 20th, this new set's discs 1-9 are all exactly the same, but the 10th disc of extras has been dropped. That's a lot of extras you won't get, so if you care about special features, make sure you're buying the 10-disc box, which is becoming harder to find and more expensive as time passes. It's only going to get more difficult as stores replace their remaining copies with the reissued one and online sellers surely start confusing the two. Thank you for this; presumably the UK ten disc entire mystery is the same as the US one and good to pick up? Yeah, you guys in the UK aren't getting that weird 9-disc deal. 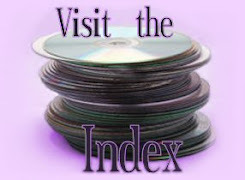 UK's the full 10-disc set with everything the US set has. Since I'm writing, thanks also for all of your work in doing the comparisons. They're really invaluable. The UK Entire Mystery is now only available from third party sellers on Amazon; perhaps this is going OOP here too. I decided to take the plunge rather than risk it. Great write-up, but you somehow completely *missed* mentioning one of the biggest extras on the Blu-ray sets - The Missing Pieces. Waayyy back in the day - 1996 to be exact - I started University, and was exposed for the first time to the Internet. 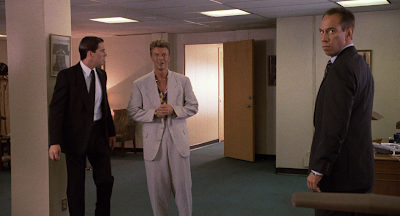 I started an "email chat group" called "Lynchians", and whenever somebody said something stupid, the standard reply would be, "Yes, right about the time that the 3-hour cut of TP:FWWM is released. 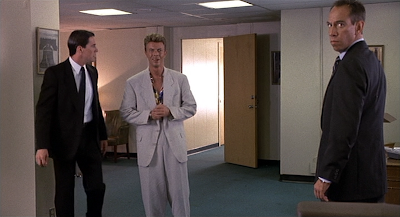 ", or some other reference to the 3-hour cut of FWWM. What can I say - it was 20+ years ago, before Amazon owned the entire internet! Also, I don't recall the exact dates of the first 3 DVD releases (S.1, S.2, and Gold Box), and it might just be the everlasting anger for companies cashing in, but I bought S.1, then S.2, then went out and shot me some money hungry basterds because it feels like the Gold Box came out about 3 weeks after S.2.